In the heart of the largest city up north, in the middle of subdivisions and commercial development, are a pair Hickories; Hickory Meadows and Hickory Hills Ski Area, two adjoining parks where the worse vice in the winter is leaving work early to spend a sunny afternoon on groomed slopes or tracks. These parks are not large – together they total only 238 acres – but in the middle of this city of 16,000 they are a relatively undeveloped tract of hills, ridges, meadows and woodlots, perfect for short downhill runs or an easy outing on Nordic skis. And that’s the best aspect of the Big Hickory; it’s a quick escape from the urban trappings that surround it. Fast, uncomplicated, nearby and cheap. Play hooky as often as you can. 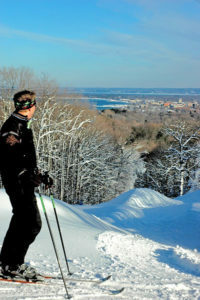 A skier takes in the view from the top of Hickory Hills Ski Area. There was a time when Hickory Meadows was little more than upland forests and wooded swamp wetlands. But following a period of logging in the mid-1800s, this series of connected meadows in the hills above Traverse City’s West Side became a cornucopia of agricultural goodness; tart and sweet cherries, peaches, apples, cabbage, tomatoes, and squash. In the 1930’s, grocer Jerry Oleson purchased 130 acres and added alfalfa to feed his growing buffalo herd that eventually expanded to more than 900. The Oleson family also allowed hikers, bikers and dog owners access to the fields. In 2004, that informal access became permanent when voters of Traverse City and Garfield Township approved a tax millage that turned these interlocking fields into a 113-acre park. Hickory Meadows is a classic urban trail system that is perched high above city neighborhoods but still bounded on three sides by even taller hills. It offers 2 miles of loops that wander over mild slopes, across meadows and through woodlands. Overall the skiing is easy but the park is located at the foot of the Hickory Hills Ski Area where the ambitious can continue their outing on trails including a 230-foot climb to the top of Hickory Hill itself. Hickory Hills dates back to 1950 when Ci-Bo Hill was opened on 12 acres as a partnership between the City of Traverse City and the local Board of Education. With the help of famed ski instructor and racer, Stein Eriksen, who arrived on his days off from Boyne Mountain, Ci-Bo was the site of ski schools and competitive racing from the first winter on. It was also the first ski area in Michigan to offer night skiing. In 1952, the city-owned ski area became Hickory Hills and gradually the area was enlarged to 125 acres. In 1985, snow guns were added, covering six of the eight runs and extending the ski season to more than 70 days. A snowshoer at Hickory Meadows. Locals loved their humble little ski hill, the perfect place to learn how to downhill. When discussions began several years ago about closing the ski area because it cost more to operate than a typical city park, they formed Preserve Hickory, a nonprofit group dedicated to saving the community ski area. Encouraged by the strong public support, the City of Traverse City, Garfield Township, and Grand Traverse Ski Club finance a Hickory Hills Master Plan in 2014 that resulted in Traverse City pledging $1.5 million toward it and Preserve Hickory promising to match that amount. Within two years the non-profit raised $1.9 million. This winter Hickory Hills will offer 5 kilometers of cross-country trails, including a kilometer lit for night skiing along with its eight downhill runs and five rope tows. 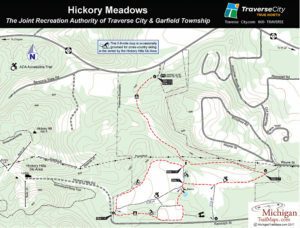 The staff grooms the Nordic trails and occasionally will also track a 0.8-mile loop in Hickory Meadows that skiers pick up from the Randolph Street trailhead on the west side of the park. In the future Hickory Hills will have a new two-story lodge, additional slopes and a conveyor belt-like lift for the kids ski hill, a tubing hill and a vastly expanded trail system for cross-country skiers and snowshoers that will link into the trails of Hickory Meadows. To encourage more year-round use there are also plans to add a single-track bike path, running trail and ropes team-building course. For more information on Hickory Meadows contact the Grand Traverse Conservation District at 231-941-0960. 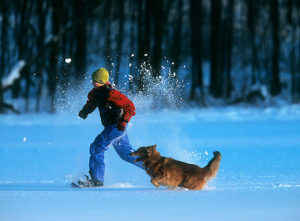 For Hickory Hills call the ski hill at 231-947-8566.